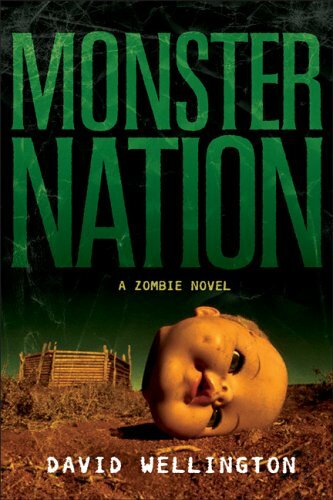 I finished Monster Nation over the weekend. I liked it a lot, though not quite as much as Monster Island. It's one of those sequels which can stand on its own, but is definitely more satisfying if the reader has already read the first book. Monster Nation tells us how the epidemic that eventually engulfs the world began. There are a few main characters, on both sides of the dead/undead divide, who we follow as the epidemic spreads and the nation slowly but surely falls to the rampaging zombie horde. David Wellington has a knack for crafting characters who are all imperfect, and entirely justified in all of their actions. Even the zombies, who are out there clawing through the brains of every living thing they can find, rarely come off as purely evil. I mean, zombies gotta eat, right? When someone is actually going to be evil, though, he doesn't pull any punches, and gives us great villains that are just as compelling as our heroes. He also does a fantastic job of giving each character a very clear voice and personality, so we feel like we're actually watching real people in real places, instead of listening to an author talk at us for a few hundred pages. It's ambitious, to tell a story that moves people from California to Colorado to Washington and back, but he really pulls it off. I thought it hit all the right notes without being too graphic and gory, and was very well-paced. Just like Monster Island, Monster Nation brought some new ideas and mythology to a genre that should have run out of original ideas a long time ago. I give it four rotting corpses out of five, and can't wait for Monster Planet to come out.